The Medicinal Chemistry Divisions of the two Belgian Chemical Societies, Koninklijke Vlaamse Chemische Vereniging (KVCV) and Société Royale de Chimie (SRC) are organising every year an international one day symposium in Belgium, with the aim to update participants on selected areas of pharmaceutical research by specialists in their respective field. In recent years, this symposium has been focussing on topics such as “From Rapid Dissociation to Irreversible Inhibition – Optimisation of Drug-Target Residence Time” (2012); “Emerging Targets and Treatments: Opportunities and Challenges for Drug Design” (2011); “Does size matter? Beyond small molecule therapeutics: challenges and success stories“ (2009); “Small molecules, Antibodies and Natural Products: Multiple Faces of Medicinal Chemistry” (2008); or “New Drugs and Drug Candidates: Recent Achievements in Medicinal Chemistry (2007)”; and has been gathering every year around 170 participants, half from universities, half from industry, both from Belgium and surrounding countries. MedChem 2013, with six invited lectures and three oral communications, will be held on Friday November 22, 2013, at the Janssen Pharmaceutica site in Beerse and will be chaired by Dr Lieven Meerpoel (Janssen Pharmaceutica, Belgium). The title and focus of the symposium will be “Constrained Peptides and Macrocycles – New Opportunities for Drug Discovery”. 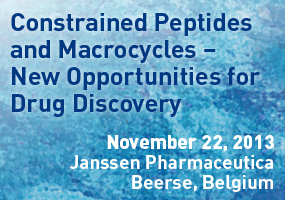 The objective of this one-day symposium is to address the opportunities and challenges offered by the field of constrained peptides and therapeutics. These molecules are generally defined as cyclic small molecules or peptides of 500 - 2000 Da. They have undergone a rebirth over the last years in drug discovery, mainly due to the introduction of new approaches for their synthesis and screening and the promise of access to previously undruggable targets. The symposium will cover recent approaches in this promising field that is highly inspired by model macrocyclic drugs such as cyclosporine, a highly successful immunosuppressant.